Specifically, the "Trusted Boot Security Feature Bypass Vulnerability – CVE-2015-2552" is my jailbreak exploit =( This is sooner than I would like, since it may hurt Windows Mobile 10 jailbreaking. I've decided to release the exploit details. Note that it's not very user-friendly at all right now. Your system will come up in "test signing" mode, along with a watermark on the desktop indicating this. While in test-signing mode, applications still have to be signed, but they can be signed by anyone, including your own self-signed certificates. How to sign executables for this is mostly beyond the scope of what I'm posting. Use makecert and signtool. Your certificate must be at least 2048-bit RSA. When using signtool, be sure to timestamp your executable (/t option), use page hashing mode (/ph) and SHA-256 (/fd SHA256). Someone I've been working with made a full jailbreak based upon this that doesn't require signing anything, like the RT 8.0 jailbreak was able to do. Stay tuned. Excellent. My surface 2 is going to have more fun. Myria, I have ported much software for jailbroken RT, and I am wondering if I should sign the executables myself and the release signed binaries, or is this something that each individual RT user needs to do themselves? Are both options available? I could sign the binaries that I have ported and self-sign the ones that other folks have ported? Hopefully this update (KB3096447 I assume based on the link) can be uninstalled (if accidentally installed) and blocked like usual. And I also hope those of us that are still on RT 8.0 and upgrade will also be able to remove and block it... would it be automatically installed on an 8.1 upgrade at this point? This is both exciting and annoying at the same time... exciting that the 8.1 jailbreak is finally being release, and annoying that the exploit is already being fixed. Once in test mode, if this update is then installed will it continue to run in test mode? Or is it possible for an update to put it back in normal (locked down) mode? My Surface running RT 8.0 just install KB3088195 that seems to refer to the same security bulletin MS15-111. It seems, that '/ can't be next to each other. 4. If time stamp server fails, just repeat the command. It's a start Thank You! Guys, who will compile C++ equivalent for this for ARM. Why do you not use the build-in command line tool? 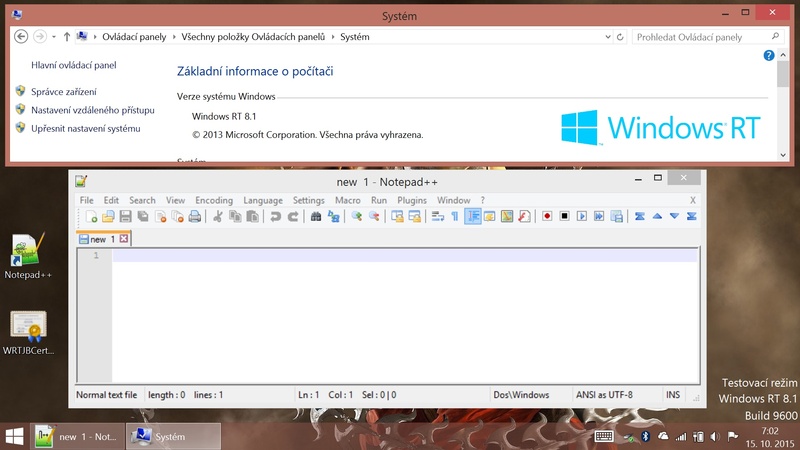 Simply execute "shutdown -t 0 -s"
EDIT: Ah, it displays the menu thats reachable via alt+f4 on the taskbar. I'm not on my surface yet and never tried it: do vbs scripts work? You can sign the binary and share the signed one, it will work Tested. Yep, but you have to share your certificate too (with pub and priv key), so user could add it to trusted root certificates inside his certificate storage. IMHO you should just tell the users the list of files, which need to be signed. I'm not sure about that, yesterday I got few signed games, shared by other person, and they work perfectly without his certificate.